Some poor countries have scored well compared to richer ones in a report assessing the treatment of children in African nations. The African Child Policy Forum, an independent advocacy agency, ranked 52 countries in a "child-friendly index". Amongst the top 10 were Namibia and Malawi, which did far better than richer countries like Sudan and Angola. Mauritius was top and Guinea-Bissau bottom in ratings based on factors such as spending on health and education. Other criteria used to assess governments included laws and policies to protect children's rights, as well as the proportion of a country's spending allocated to nutrition, water, sanitation and military resources. Poverty is not an excuse to treat children badly - that is the central message of the report. The independent pan-African advocacy organisation, which is based in the Ethiopian capital Addis Ababa, found that some of the poorest countries score surprisingly well. Have Your Say: Who should protect children? "Governments that have come out well have put in place laws to protect children from abuse and exploitation, and they've targeted resources at children through better health and education," says Sir Richard Jolly, formerly of UN children's agency Unicef and now an adviser to ACPF. "Money or the lack of it is not an excuse," he adds. 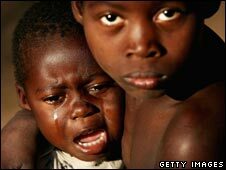 Eritrea, Ethiopia, Central African Republic and Chad were considered to be among the least child-friendly countries. Malawi ranks first in its budgetary commitment to children, but has the 45th lowest gross domestic product (GDP) per capita in Africa. And Equatorial Guinea ranks 44th in its budgetary commitment, but has one of the highest GDPs per capita in Africa. Dr Assefa Bequele, the Executive Director of ACPF, says the usual style of UN development reports which compare countries across the globe are easily dismissed by African governments. "Comparing Switzerland to Rwanda is pointless; the only thing they have in common is both are land-locked," he says. "The idea is to encourage countries to become more child-centred by showing how they compare to their neighbours." When it comes to protecting children from harm and exploitation, Kenya comes out top. It has laws against harmful traditional practices, trafficking and sexual exploitation, and is one of the few countries where corporal punishment is banned in schools and prisons. However, the report found that a third of African countries offer no protection against child trafficking, and a quarter do not outlaw female genital mutilation. Because this report has been compiled by an African organisation for Africa, it may have more traction across the continent. It will be repeated every two years to monitor progress. Its authors expect countries that do focus on their children to develop faster than those which do not. "The countries that invest in children will have a more productive work-force and the foundation of a more peaceful and democratic country. The investment will certainly pay off," says Dr Bequele.